This glamorous sequin party dress has a beautiful and unexpected combination of pale gold sequins against an ivory background. The Ivory Sequin Party Dress is fully lined. 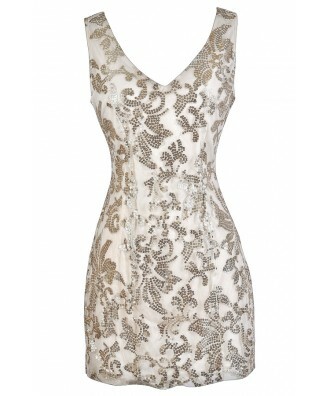 It has an ivory mesh overlay with miniature pale gold sequins throughout. We love the simple, yet striking cut of this dress. It has wide shoulder straps, a plunging neckline, an empire waist, and a great fitted cut. A hidden back zipper completes this look. 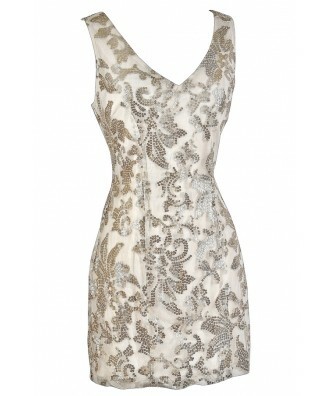 The Ivory Sequin Party Dress is perfect to wear to your next semi-formal event. It looks great paired with strappy metallic heels and a beaded clutch. Details: Fully lined. Boning at bust. Hidden back zipper. 100% polyester. Lining: 100% polyester. Dry clean only. Small measurements: Length from top of shoulder to hemline: 33". Bust: 33". 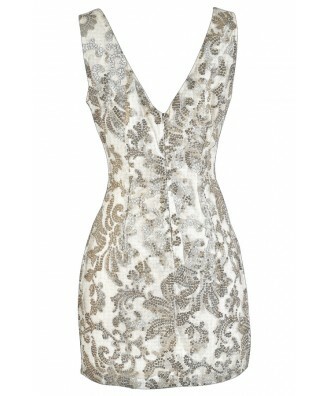 You have added Ivory Sequin Party Dress into Wishlist. You have added Ivory Sequin Party Dress for Stock Notification. You have set Ivory Sequin Party Dress as a loved product. You have removed Ivory Sequin Party Dress as a loved product.